The April 2019 issue of Square Enix's GFantasy magazine announced a TV anime adaptation of Iro Aida's Jibaku Shounen Hanako-kun (Toilet-Bound Hanako-kun) manga on Monday. The comedy supernatural manga began its serialization in GFantasy in June 2014, which has nine volumes in print as of October 2018. Square Enix plans to publish the tenth volume on March 27. 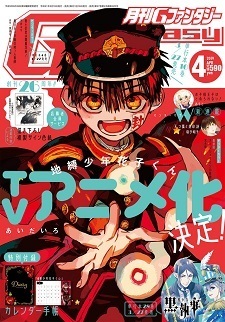 Jibaku Shounen Hanako-kun has a cumulative 1.5 million copies of its compiled volumes in circulation. Yen Press licensed the manga in English in July 2017 for digital release and published the ninth volume on January 29. Looks ok, i will give this one a try. Hope it's more of a shounen and less of a shoujo. From what i have heard from other readers this series is quite good. It looks cool, I'm on board. Lol, this seems like it’ll be a hilarious watch! Thanks. I'm looking forward to this anime then. Looks cute and nice! I might check this one out! I'll check it out even though it has romance. I love the manga so I’ll definitely be watching this. im so happy as a fan!!!!! Because today after all is today and once you wake up, it'll be a new morning"
A fine choice for an anime adaptaion. I think many will enjoy this supernatural, comedic, dark, romantic, work of fiction. I eagerly await this one. I voted for this one! A boy Hanako is a rare gem. Where do you see the trap? Hanako-kun (pictured on cover) is a ghost boy wearing gakuran. Ah yes, dat face tho. Yay !!! :D I love the manga so much! Glad to see it’s getting an anime.